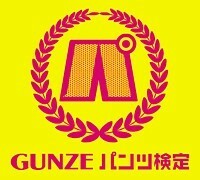 Japanese clothing manufacturer Gunze has announced the establishment of an underwear knowledge certification test called the Gunze Pantsu Kentei, which they will begin offering on March 1. Open to anyone interested (who can read Japanese), the test consists of 100 multiple-choice questions designed to measure one's general and historical knowledge of underwear. The questions vary in difficulty and range from the obvious to the arcane. Test takers are assigned a certification level (1 to 4) based on their results, and they are given a nationwide rank to see how they stack up against the competition. Top performers will be awarded special prizes, the company says. - How do you say "underwear" in Thai? - When is Underwear Day? - What were the world's first commercially available underwear briefs called? - How do you say "T-back" in English? - Who gave Kitaro [from the manga/anime Ge Ge Ge no Kitaro] the "demon underpants" (oni no pantsu) he wears? Although the Gunze Pantsu Kentei may be a marketing gimmick to promote the company's undergarment sales, it could very well become the much-needed defacto standard by which underwear insiders measure their knowledge of things unmentionable. Underwear Day (pants no hi) is August 2. Split the word 'pantsu' into 'pa' (a variation of 'ha', or 8) and 'tsu' (sounds like 'two' in English), and you get 8/2, or August 2nd. Level 1 baby, here I come!